Mona Therese is trained in the linage of Krishnamacharya, and her main focus is on breathing, Hatha/Vinyasa Yoga and Meditation. Her fascination of the human being, not only physically, but also mentally and spiritually shines through in her teaching and her own self. Mona Therese’s journey on the path of yoga started at the age of 18 when she got the book "Ramana Maharshi and the Path of Self-Knowledge", which was a great inspiration and gave her a bigger understanding of her own Spirituality and where she wanted to be in life. Her teachings are influenced by the practice of Ashtanga Yoga by her teachers Lino Miele and the late Gwendoline Hunt. Later on, from an injury and a deep desire for understanding how Yoga Asana works, she ventured into the practice of Iyengar Yoga with one of her teachers, Claus Wittig in Denmark. When she read "Autobiography of a Yogi," Mona Therese found the missing link in her own practice and got Initiated into Kriya Yoga by Sri Swami Shankarananda Giri from Rishikesh, India. Mona Therese started Meditating at age 21 with her first introduction to meditation through TM (Transcendental Meditation). At her first visit to India she was introduced to the practice of Zen Meditation and the teachings of Thich Nhat Hanh, and immediately realized she had to explore his teachings more. This desire brought Mona Therese to Plum Village for a long retreat in south of France, an experience which had a great and life changing effect on her, and she took the practice and teachings to heart. Mona Therese attended a five day workshop with his Holiness the 14th Dalai Lama in Copenhagen Denmark, on the topic of the Heart Sutra. This workshop opened a new door in her personal practice and her longing for wisdom and knowledge, which began her next journey on the path. Mona Therese is a graduate from the Chopra Center University as a Certified Primordial Sound Meditation Teacher, in Carlsbad, California. Her many years as a teacher of Yoga, and as a therapist of Body Work, Massage, Reflexology and Reiki Healing has given her a profound insight into the mind/body connection. It is Mona's goal to inspire her students to find their inner being of strength, peace and compassion, thus allowing the student to water their own seeds towards "Self Realization." Through her own healing from cancer, Mona has gotten the insight and the knowledge of the power of thoughts, and how we can transform ourself through positive intentions and affirmations. Mona is the creator of the app, "Affirmation/Transformation." She is a published writer and an "Architect of Change" with Maria Shriver. Mona has been instrumental in the guidance and teaching of international celebrities including heads of state, movie stars, and leaders in the medical field in the Art of Yoga, Pilates and Reiki Healing, and continues to integrate Eastern and Western philosophies and traditions, respectively. 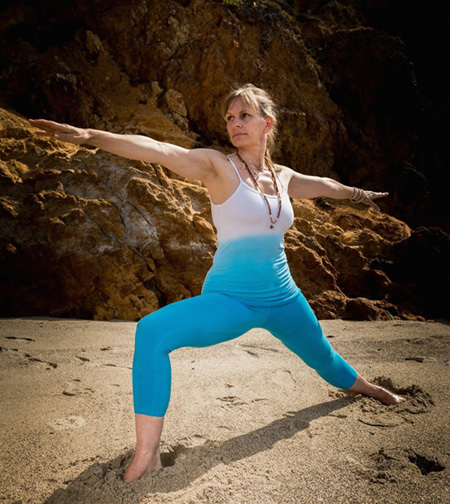 Mona has taught nationally and internationally throughout her life and has been teaching at the Vajra Pani Yoga Teacher Training for four years on the topics of Vinyasa Flow, Chakra Anatomy, and Pranayama. In 2013 Mona started to teach "Asana Alignment & Assist" and the "Basic of Ayurveda" at the Rasa Yoga Teacher Training. Mona lives in Malibu, California, with her Husband and Her Cat, where she practices as a Reiki Master Healer, teaches Yoga classes, and is available for personal training, groups and corporate classes.